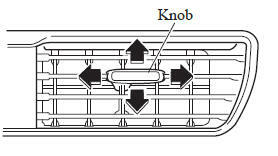 To adjust the direction of airflow, move the adjustment knob. When using the air conditioner under humid ambient temperature conditions, the system may blow fog from the vents. This is not a sign of trouble but a result of humid air being suddenly cooled. The air vents can be fully opened and closed by operating the dial.